They’re bulking up on autumn-blooming rich nectar sources for the remainder of their migration and the long winter ahead! 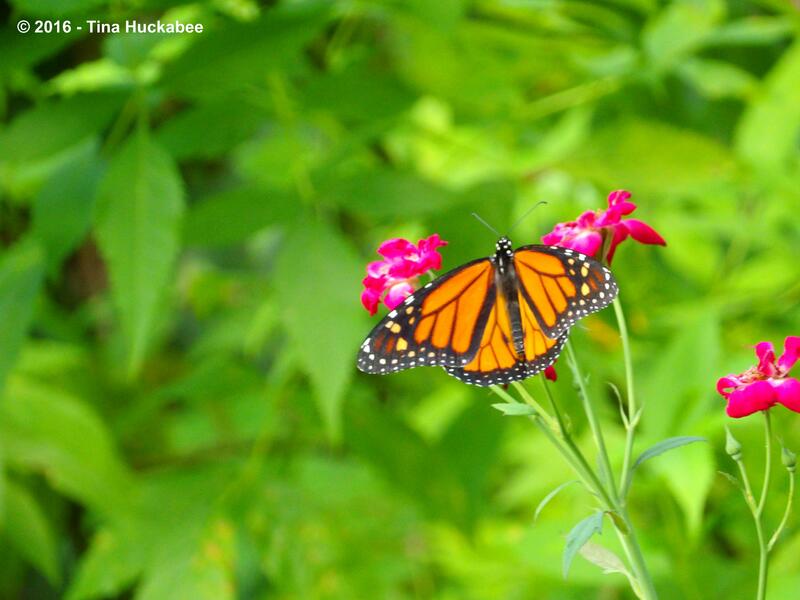 Monarch butterflies, Danaus plexippus are in the process of one of the longest insect migrations in the world. 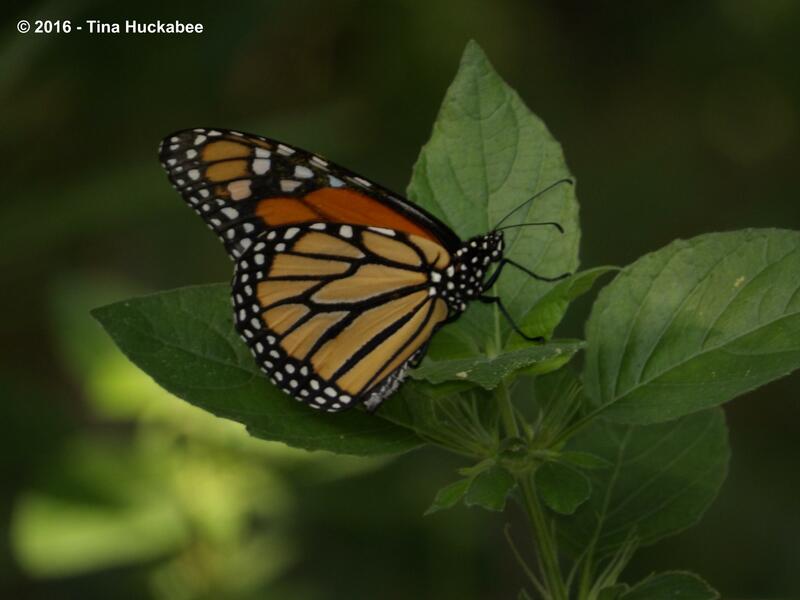 Click on this link for information about the Monarch and a “Journey North” map which shows the spring migration northward from Mexico. Currently, the southbound migration from Canada to Mexico is underway. 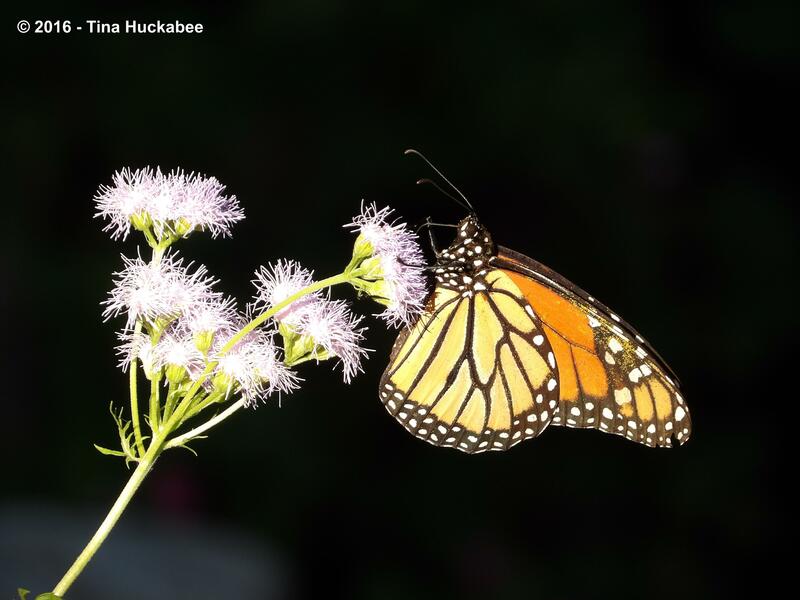 The major routes of the Monarch converge in Texas and it’s imperative that they have plenty of nectar sources to feed on for migration and preparation for overwintering in Mexico. 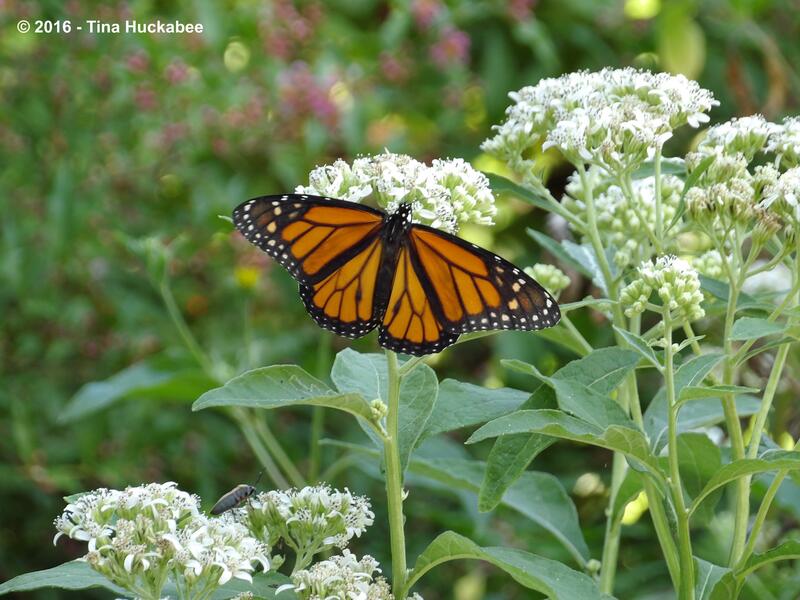 Much has been made of the importance of milkweed for Monarch survival because it’s the host plant for this insect. Monarchs having adequate milkweed to lay their eggs on and to nourish the larvae in spring and summer is vital for their survival, but for the fall migration back to Mexico, nectar plants (of all kinds, but native flowers are the best) are required to sustain the health of the adults who will over-winter in Mexico. Travel well, remarkable ones, and have a safe winter in Mexico. Come back soon–maybe next March?? 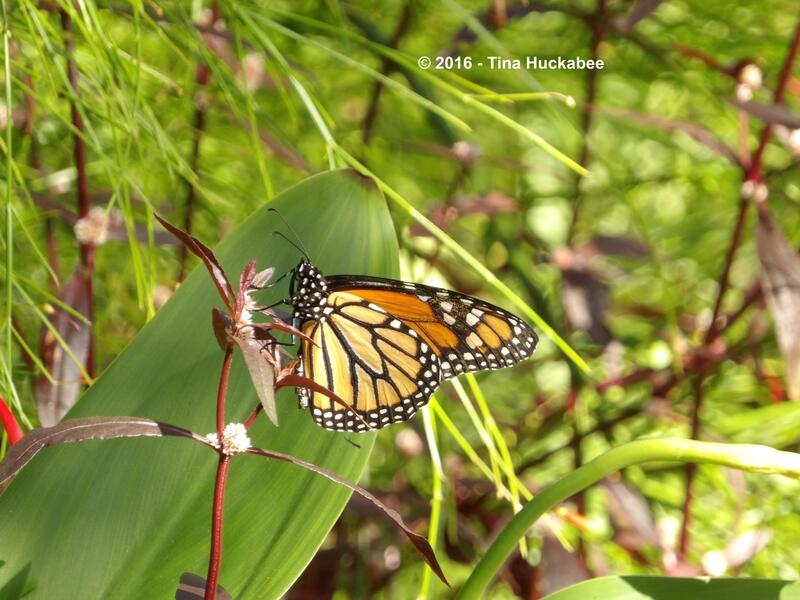 This entry was posted in Danaus plexippus, Monarch, Monarch Migration, Monarchs in Austin, Uncategorized by Tina. Bookmark the permalink. So beautiful. What a privilege to play host to these glorious creatures. Yes, it is a privilege and one I don’t take lightly. Thanks, Gillian. I agree that I am lucky–these butterflies are “looking good” in my garden. I thought I saw a Monarch flying through the marina on Wednesday. I very well might have. And just yesterday, I found shrubby boneset, frostweed, mistflower, native Turk’s cap, prairie agalinis, snow-on-the-mountain, and partridge pea just thick out at Armand Bayou. Any butterflies that stop by will find treats galore — just as they have in your garden! It must be so satisfying to help them out as you do. 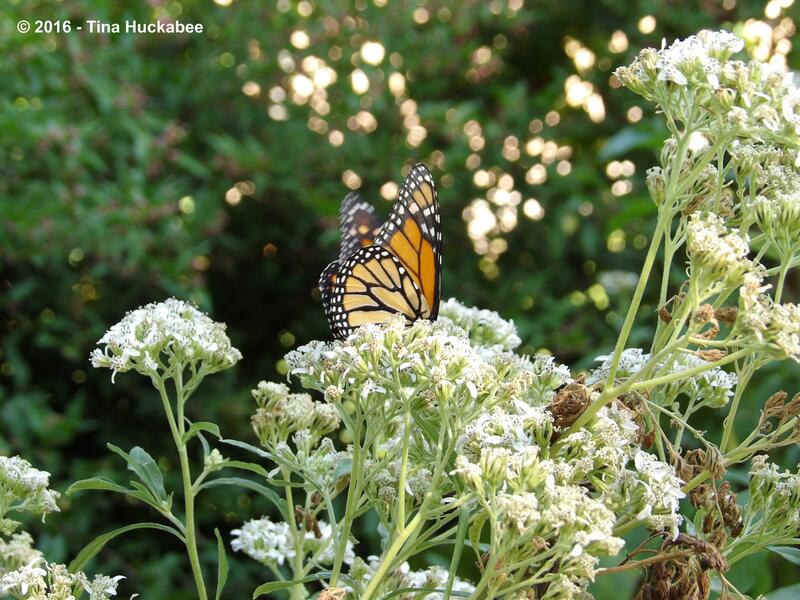 All of the plants you mention are great natives for Monarchs–and all other pollinators, Whoo-hoo that they’re growing and blooming! I love them,too. I am amazed by their flight and plight. I hope you have read Barbara Kingsolver’s book Flight Behavior. I haven’t read that book, but I’m a big fan of Kingsolver–a beautiful writer. I’ll put it on my “must read” list. Thanks! That is great news that so many are passing through your part of the state. I have had a few more butterflies lately. I saw very few Monarchs in the spring, though apparently, there were lots in the Hill Country. I’m so gratified and thankful to have them–and all the other winged wonders–visiting. Tina es una maravilla que la mariposa Monarca pase y repose en su jardín, se alimente de sus plantas. Es una verdadera amante de los animales teniendo plantadas plantas melíferas para las mariposas Monarcas que están cansadas por su gran viaje y para el resto de insectos polinizadores. Gracias Tina. Saludos de Margarita. I do hope that my garden provides respite and nourishment for these migratory butterflies on their long flight. I’ve had them in my garden, too. Hooray!! It’s always exciting to see them! It’s great to see them, indeed!! YAY! They are still migrating through this area, we saw several this morning. Let’s hope their numbers rebound in 2017. Great!! That means more coming my way! That’s so great that you raised some–I’ll pass on your good wishes. I hope there are an abundance wintering in Mexico this year!